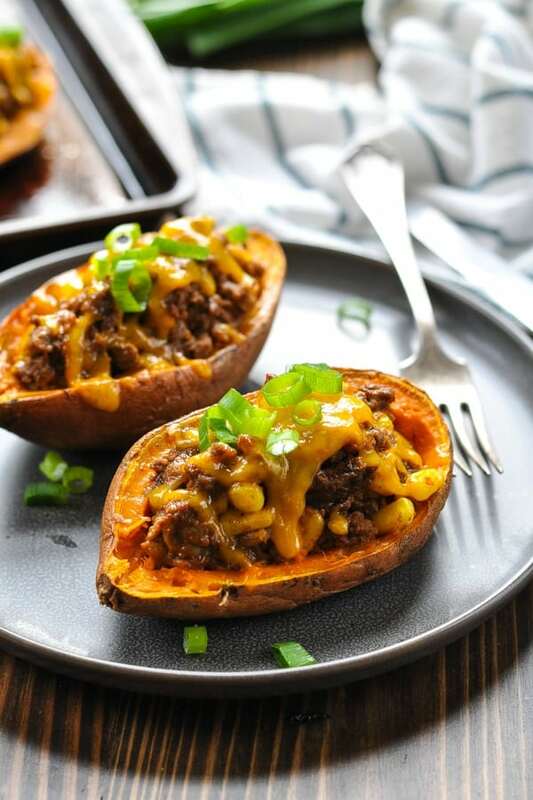 A family-friendly healthy dinner recipe is ready in about 30 minutes with these delicious Taco Stuffed Potatoes! 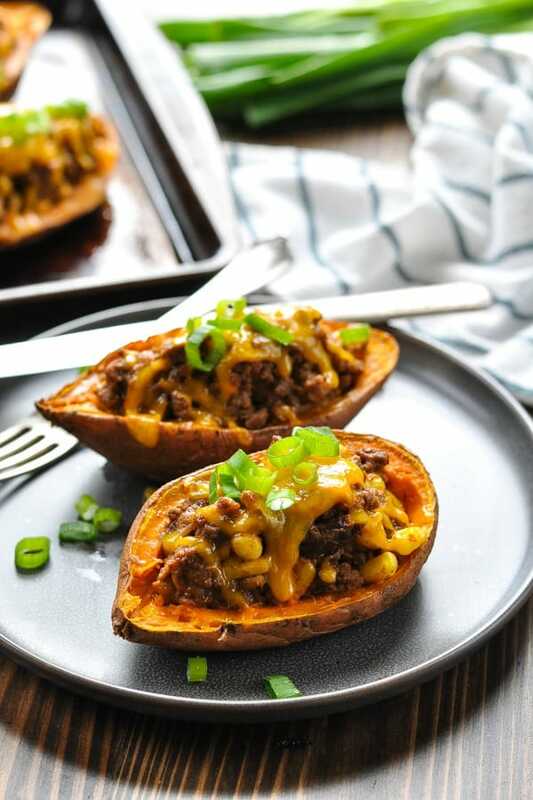 A family-friendly healthy dinner recipe is ready in about 30 minutes with these delicious Taco Stuffed Potatoes! 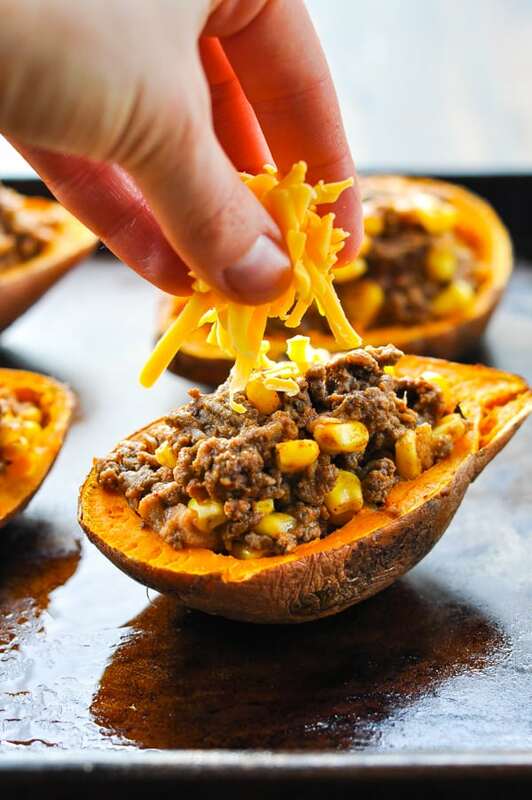 Whether you use sweet potatoes or russet potatoes, ground beef, turkey or chicken, everyone will love this easy make ahead meal! I’m always excited when I can share simple and nutritious dinnertime solutions with other busy parents. That’s my goal on this blog — making your life a little easier — so a recipe like this makes me really happy! My stuffed potatoes recipe is adaptable to suit your family’s tastebuds, so feel free to adjust the ingredients according to what you love most. How do you make a Stuffed Baked Potato? First, let’s get the potatoes ready! I like to use the microwave to “bake” my potatoes because it only takes about 5-10 minutes. 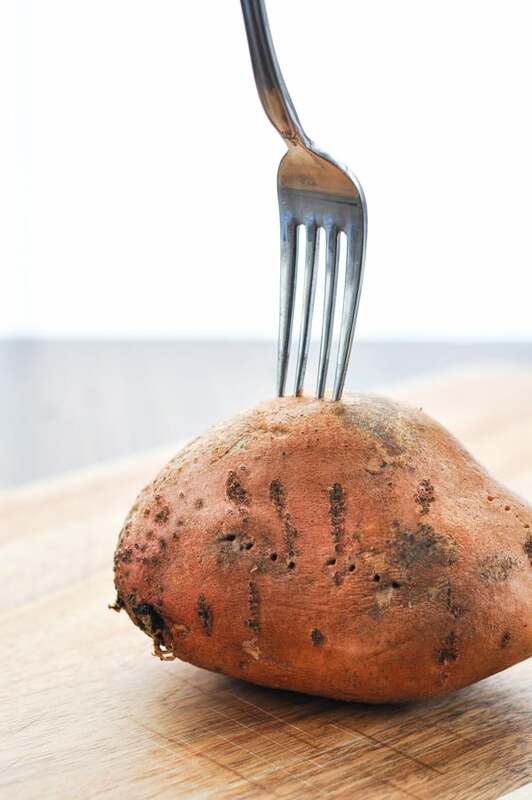 Be sure to prick the potatoes with a fork before cooking them in the microwave in order to allow the steam to escape. Once the potatoes are cool enough to handle, slice them in half lengthwise and scoop out the inside leaving just a thin layer of potato around the skin. Basically we’re making stuffed potato skins! Once the potatoes are hollow, spray them with olive oil and bake in a 450 degree F oven for 5-7 minutes (or until they’re slightly crispy on the outside). What do you put inside a baked potato? 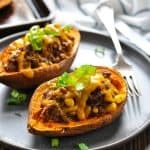 The options for stuffed potato fillings are endless, but today I’m showing you Taco Stuffed Potatoes with ground beef. While the potatoes are cooking, brown ground beef and onion in a large skillet. 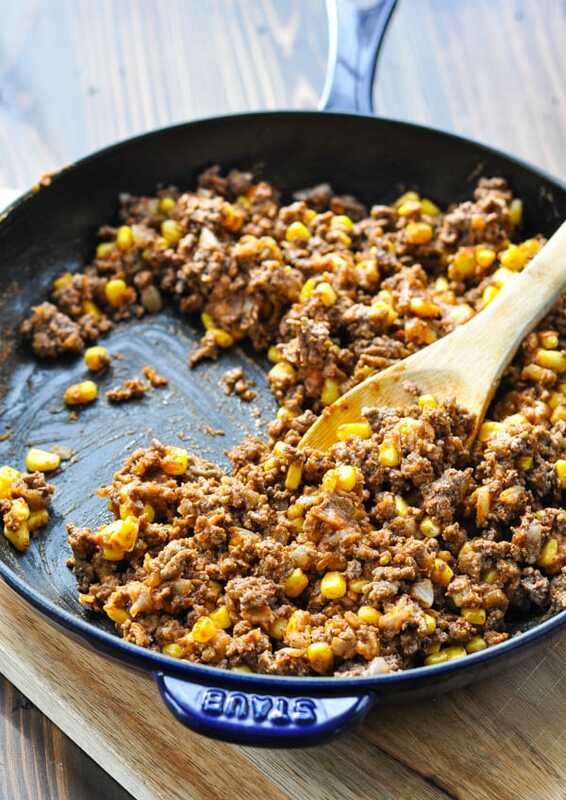 Add the taco seasoning, corn and refried beans to the meat mixture, stirring to combine. This mixture will be thick, so it’s easy to stuff inside the potatoes without everything falling out. Spoon the meat mixture evenly into the potato skins. …and then place under the broiler for 2-3 minutes, or just until the cheese melts and everything is heated through. Garnish with sliced green onions, salsa, guacamole, sliced olives, sour cream or any of your other favorite taco toppings! Can I make Stuffed Potatoes ahead of time? Yes! You can cook the potatoes and the filling in advance, stuff them at your convenience, and keep them covered in the refrigerator until you’re ready to place them under the broiler. That’s my kind of cooking!! No last-minute prep, no rushing around the kitchen at 5:30 p.m. when the kids are tired and hungry, and no stressing about whether or not the family will enjoy the food. These stuffed potatoes are healthy, fast, and delicious! Can Stuffed Potatoes be frozen? Yes! 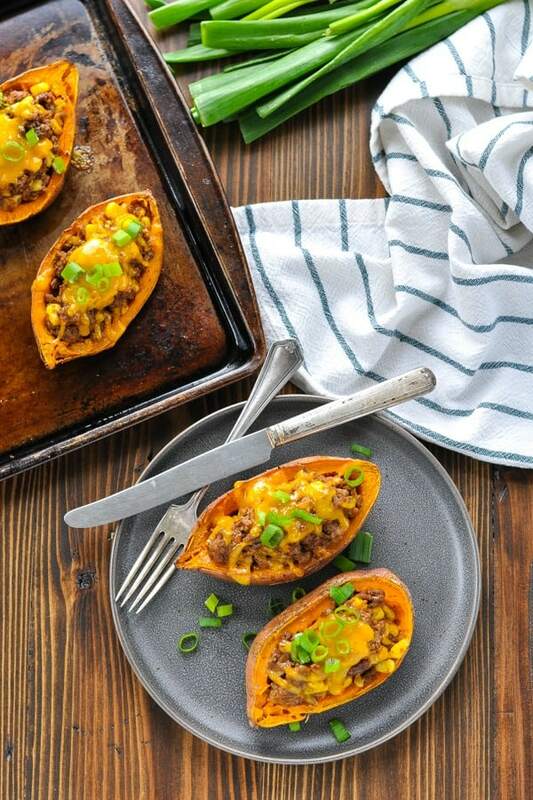 You can assemble the stuffed potatoes and freeze them just before broiling, or you can freeze leftovers that have already been finished under the broiler. To freeze: Cover potatoes with plastic wrap and place baking sheet in freezer, leaving several hours until potatoes are completely frozen. Remove potatoes from freezer and wrap each potato individually in plastic wrap or foil. Place wrapped potatoes into one or more Ziploc freezer bags. Store in freezer for up to 3 months. If you have time, thaw the potatoes in the oven overnight. Reheat in a 350 degree F oven for 15-20 minutes, or just until heated through. To Reheat FROZEN stuffed potatoes: Preheat oven to 350°F. Place potatoes on baking sheet and loosely cover with aluminum foil. Bake about 45 minutes. Uncover and bake an additional 15 minutes or more until potatoes are hot. Load the potatoes with plenty of toppings, and you don’t really need anything else! Try sour cream, salsa, guacamole, green onion, diced tomato, sliced olives or fresh avocado. Set out a bowl of tortilla chips and Fresh 5-Minute Homemade Salsa. Offer tortilla chips and 3-Ingredient Queso Dip. This Healthy and Easy Corn Salad is also a nice addition to the meal! You can use either sweet potatoes or russet potatoes (or a combination of both) for this recipe. 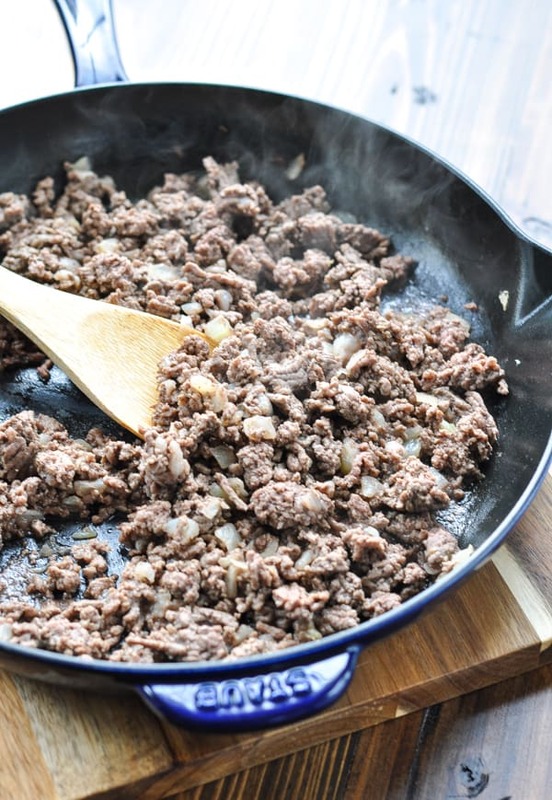 This recipe calls for ground beef, but you can substitute with an equal amount of ground turkey or ground chicken. The refried beans add flavor and nutrition to the dish, and also help to hold the filling together (which makes stuffing the potatoes easy). If you don’t like refried beans, you can simply omit them — but the dish will not be nearly as flavorful or easy to scoop. 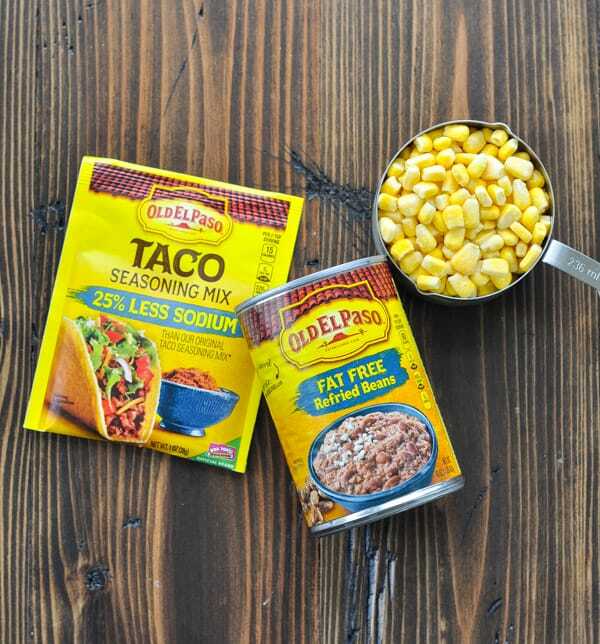 I use a 1-ounce packet of reduced sodium taco seasoning for convenience, but you can substitute with an equal amount of your favorite homemade taco seasoning blend. Preheat oven to 450 degrees F. Line a rimmed baking sheet with foil and spray with cooking spray. Scrub the outside of the potatoes until they are clean, and prick each potato with a fork a few times to allow steam to escape during cooking. Place potatoes on a microwave-safe plate and microwave 2 at a time for approximately 5-10 minutes, or until tender. Let cool for 5 minutes. Meanwhile, brown onion and beef in a large skillet over medium heat. Drain and return to skillet. Add the taco seasoning, corn, and refried beans to the meat mixture and stir to combine. Cut sweet potatoes in half lengthwise. Scoop the inside of the potato out of the peel, leaving a thin layer of potato inside. Set aside the flesh that you just removed and use it for a separate meal, if desired. Spray the potato skins with cooking spray or rub with olive oil, place on the baking sheet, and bake for about 5-7 minutes (or until outsides are slightly crispy). 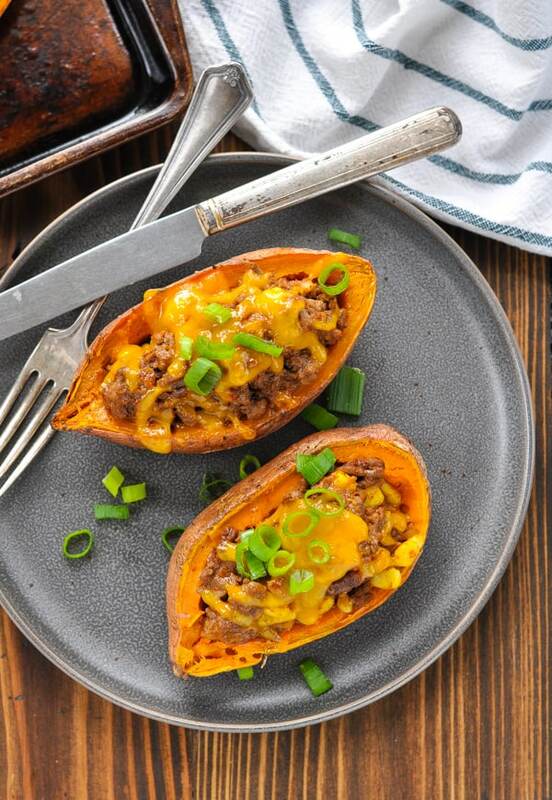 Remove potato skins from the oven and stuff with meat mixture. Sprinkle cheese evenly over top. Turn oven to “broil.” Place the stuffed potatoes under the broiler for 2-3 minutes, or until cheese is melted and potatoes are warmed through. Garnish with toppings of choice! Yes! You can cook the potatoes and the filling in advance, stuff them at your convenience, and keep them covered in the refrigerator until you're ready to place them under the broiler. Load the potatoes with plenty of toppings, and you don't really need anything else! Try sour cream, salsa, guacamole, green onion, diced tomato, sliced olives or fresh avocado. The refried beans add flavor and nutrition to the dish, and also help to hold the filling together (which makes stuffing the potatoes easy). If you don't like refried beans, you can simply omit them -- but the dish will not be nearly as flavorful or easy to scoop. This post was originally published in August, 2015. It was updated in February, 2019. Oh these potatoes look fantastic, Blair! 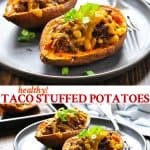 I absolutely love your creativity with the taco filling!This sounds like such a great way to jazz up potatoes. an’t wait to try this out! Pinned! Thanks so much, Gayle!! ? Oh good, Linda! I hope you all enjoy!! 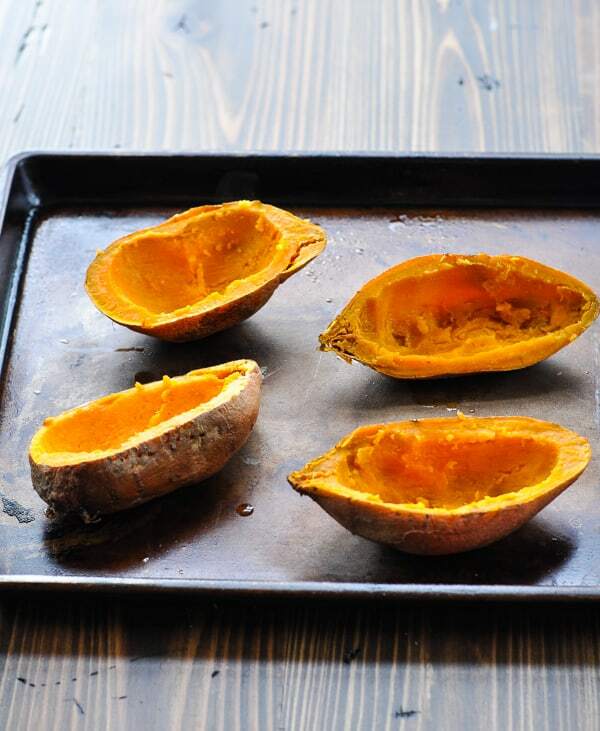 What a fun way to enjoy sweet potatoes! They are my favorite and I would have never thought to stuff them with a taco filling. Sounds so good! 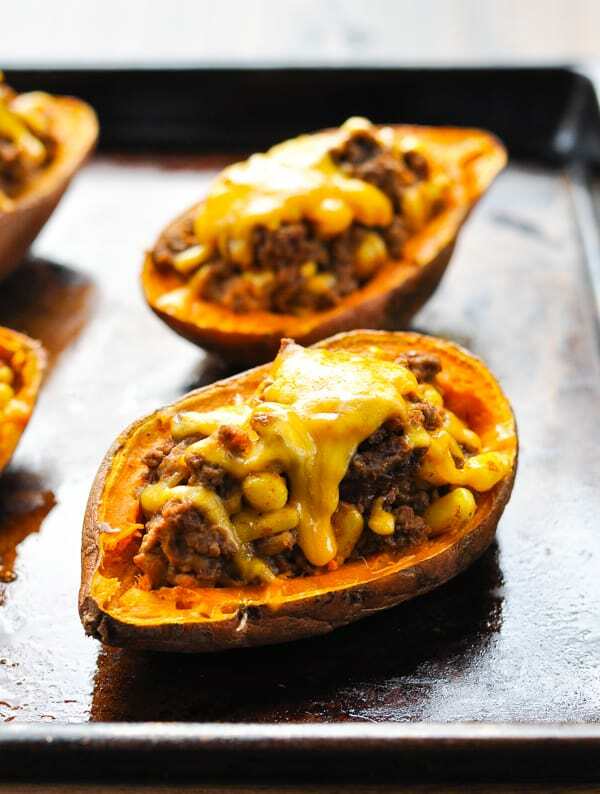 Aw, my stomach is growling just looking at these yummy stuffed potatoes!! 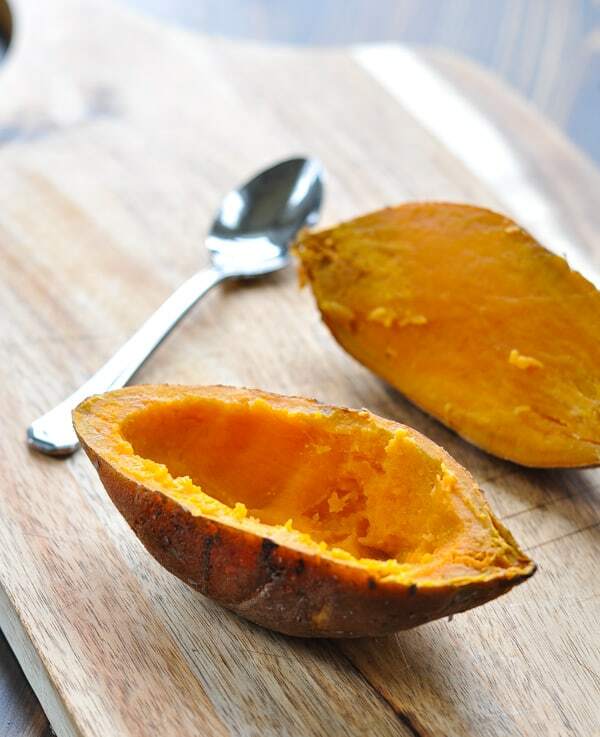 I could live off sweet potatoes, so I’m definitely with you on those cravings! I’ve seriously gotta make these happen at my house soon! Pinned! These look awesome Blair! I’m trying to cut back on my carbs and this looks like a perfect meal! Anyone have the calories and fat count on these delicious Looking potatoes? Hey, Sarah! I just updated the recipe with a nutrition panel so that you have the full information! 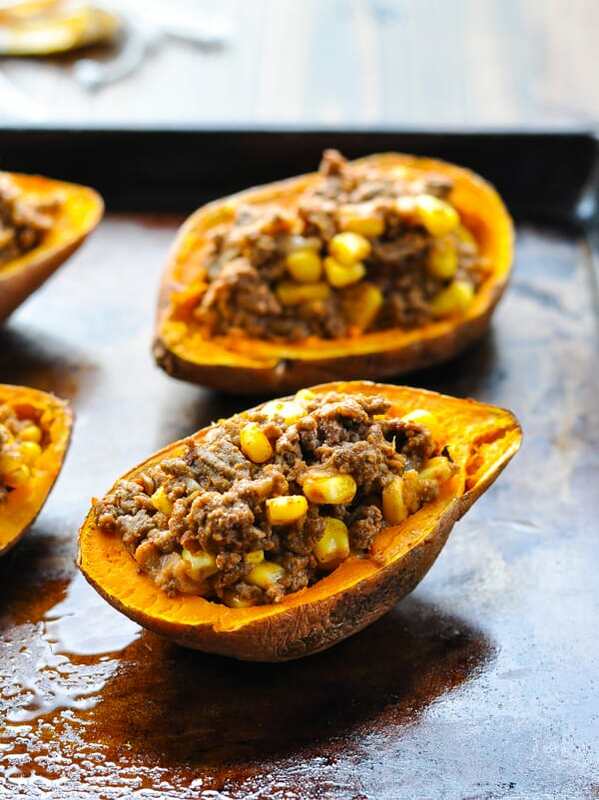 It’s based on 4 servings, using lean ground turkey and medium-sized sweet potatoes (about 114 grams each). Hope that helps, and enjoy! Wasnt going to make meatkoaf or shepperds pie again..
What sauce did you put on top??? Hi, Erika! I didn’t put any sauce on top — just the melted cheese. But some extra salsa, guacamole, and/or sour cream would all be great toppings!